Art-in-Buildings: In The Journey of Transformation you explain the disconnect between the Western desire to control nature and the ancient Chinese philosophy that humans are simply a part of nature, unable to control it. How does this conflict impact your practice? Cui Fei: The main distinction between the Western and the ancient Chinese understanding of nature is where human beings are positioned in relation to nature: above or within. One of the consequences that results from this difference is whether we think we can dominate and control nature; or we are just part of nature, and there are forces in nature that are beyond our control. In the West, there is a huge division between human beings and the natural world. It is thought that nature can be revealed as it truly is by science, and can be manipulated by human beings to meet their needs. For the ancient Chinese, there is no distinctive human nature apart from natural nature. In Chinese cosmogony, nature, human beings, and all other parts of the cosmos equally belong to one organic whole. They interact with each other and are governed by the same natural laws. Human beings are not beyond everything in nature. Recognizing these different regards of nature had a great impact on my work. During the critiques of my early studies in the US, I found that my paintings could easily communicate with Chinese students but not with Americans. I realized this phenomenon is based on different understandings of nature cultivated respectively by Eastern and Western philosophical traditions. Through encountering this difference, I recognized that my understanding of nature was radically Chinese, a fact that I had not been fully aware of. This led me to trace my philosophical roots in Chinese culture. Making work for me is not only a way to understand the outside world, but also a process to understand myself. Since then, the focus of my work changed from images of nature to the concept of nature. I made the painting Manuscript of Nature I, which was a departure from my early paintings in both content and style. I felt so close to my work, and I could express what I want to say more directly through it. I started to incorporate natural elements into my work and over time the media of my work shifted from solely painting to installations and other mediums. AiB: You use a lot of repurposed natural materials in your artwork. How do you choose your medium for each series? CF: I collect materials all the time and choose them very intuitively. Sometimes I can immediately use the materials in projects that I am developing. Sometimes I have the materials in my studio for years before my ideas and the materials coalesce into a new work. For example, in the Manuscript of Nature series, I started using dried leaves and their imprints as characters which resembled Chinese calligraphy written in regular script. While working on this series, I happened to find pieces of dried tendrils that had fallen off from my installation made from grape vines. In one of those exciting moments of discovery, for the first time, I saw that the tendrils looked very much like the brush strokes of calligraphy in the grass style. I took the tendrils off that piece and pinned them directly to the wall to make a new installation. Later on, I found thorns from a black locust tree and used them for large panel of works suggestive of regular script in small characters. For me, each material conveys different messages: the messages from the large installation of tendrils are poetic; the messages from thorns are sharp and full of criticism. AiB: Your practice involves traveling to different locations to collect materials. Can you expand on this process and the importance of collection and traveling in your work? CF: Since I live in the city and most of my work uses natural materials, travel is often required. I've been to places to collect materials as close as Forest Park in Queens, and as distant as the suburbs in Beijing. I collect almost all the natural materials by myself. I make my initial selection of the materials on site, refining my choices further in the studio. More importantly, I can discover new materials when I am out in nature. To collect my materials, it has been necessary for me to learn more about the plants, their characteristics and habitat. Integral to my practice is working with nature, rather than working only in the studio. AiB: You write in your artist statement that you "see nature as consistent and ordered, thus providing a therapeutic agent for healing and harmony in an otherwise chaotic world." How have recent environmental issues confirmed or challenged this idea? CF: The nature I wrote in my artist statement refers to the Chinese concept of nature. As I mentioned in question #1, ancient Chinese believed that nature, human beings, and all other parts of the cosmos are governed by the same natural laws. These natural laws do not change over time, and cannot be altered by any conditions. In this sense, I think nature is consistent and ordered. These laws certainly apply to the recent environmental issues. Human beings are part of nature and ancient Chinese philosophy emphasizes maintaining harmony between humans and nature. The recent environmental issues are caused by excessive use of natural resources. The harmony between humans and nature is broken, which in return, jeopardizes our basic living conditions. CF: I have just begun my artist-in-residence at the Center for Book Arts. I am very excited to learn and explore this medium. I am also working on shows scheduled later this year. 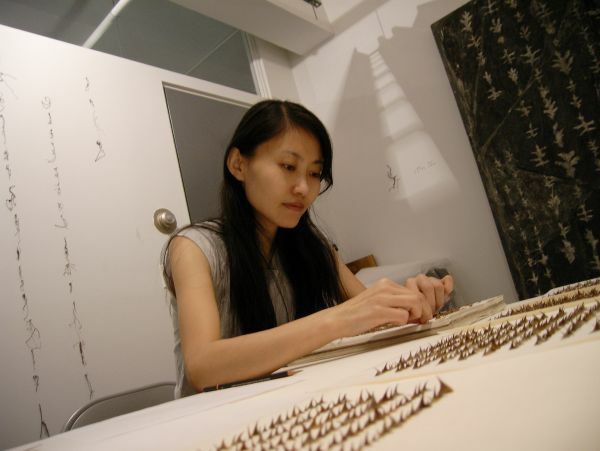 Learn more about Cui Fei's work on her website at www.cuifei.net.